In the summer of 2009 Ian Lesnet setup a Bus Pirate v2go preorder as a fundraiser for Hack a Day. It was a lot of fun, so he started Dangerous Prototypes. We’ve done one preorder project per month since September 2009. There might be readers who didn’t follow the Hack a Day preorder, so we wrote this post to explain the process. If you’ve participated in a preorder, there might still be some interesting behind-the-scenes info about how your hardware was made. We’re open source hardware and software enthusiasts who like to make stuff. We don’t have our own pick and place machine, and we don’t assemble kits, but you can get a copy of our projects at Seeed Studio. When you buy a copy of our project at Seeed, they kick a few bucks back to us so we can make more open source stuff. We’re proud to work with Seeed to make our open source projects available to everyone. When there are cheap rapid prototyping machines you’ll be able to print our projects at home, until then, there’s Seeed Studio. Seeed has inexpensive worldwide shipping starting from $2.85, most of our projects include shipping in the cost. Lots more about the preorder process below. When we publish a new open source hardware project it’s available immediately for preorder at Seeed Studio. You can reserve a copy of our project and Seeed will manufacture it for you. Hardware ships to preorder participants first, any extras go in the Seeed store and are available for immediate delivery. Seeed’s preorder opens shortly before we publish our project because we need the link to their page. Keen observers will see the project pop up early on the Seeed new project page. You can reserve a copy of our project and Seeed will manufacture it for you. Within about a week of accepting preorders, Seeed orders components for the project. This used to take up to two weeks, but we’re starting to estimate and order parts before publishing the project to decrease the total preorder timeframe. This is a huge opportunity for delay. If a critical, non-substitutable part is in short supply the preorder could be delayed for a few weeks (or months!) while manufacturers to produce and deliver the needed parts. We have a distinct disadvantage over ‘big players’, when you ask Microchip for ten-thousand PICs they jump, but when you ask for 100 you’re at the bottom of the list. We’re getting better about ensuring part availability, so this is less of a problem that it was when we did the first few preorders. Seeed also sends the PCBs to be manufactured at this time. They usually go out on a Friday and return on Monday. This is an easy, low-key part of the process. When the parts and PCBs are at Seeed, they’re ready to assemble. Small quantity projects are assembled in-house by hand, but large runs are sent to factories with pick and place machines. 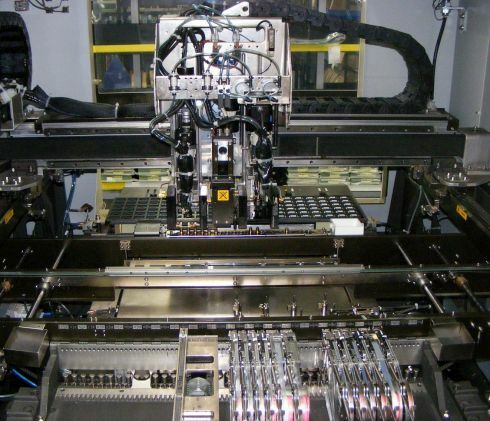 Surface mount components are placed on panels of PCBs, and then soldered in an industrial reflow process. Through-hole parts are soldered by hand for medium quantity projects (~100), and they’re wave soldered for larger quantity projects like the Bus Pirate (>200). Assembled boards are returned to Seeed on large panels. Seeed starts by breaking boards from large production panels. They inspect them visually for defects, and then program the microcontoller. Many projects, like the Bus Pirate and USB IR Toy, have firmware with a self-test function. Seeed runs the self-test and holds defective boards for inspection and repair. Seeed will email a confirmation with a tracking number when your order ships. The default shipping method is Hongkong Post. On a good day Hongkong Post arrives in the US or EU in 4-5 business days, during holidays it can be painfully, miserably, aggravatingly slow. Use the Hongkong Post tracking site to see when your package leaves China. Hongkong Post only tracks to the Chinese boarder, but they provide links to local mail services with further information in some countries. The first orders usually start to arrive somewhere between 3 and 8 weeks after the preorder starts. Should I just build it myself? Absolutely, our work is open source and we encourage it! Send us a picture and we’ll post it on the blog. We find that group orders with Seeed can be cheaper than making your own one-off though, especially if you need PCBs. If you don’t know how to source parts, or you don’t want to solder the SMD packages used on many of our projects, then Seeed might be a good option too. Always expect delays. Manufacturing very small quantities of hardware is tricky because we’re the lowest member of the food chain. Big companies plan, source, and manufacture products months in advance, and they have the pull of thousands of units to motivate their suppliers. We’re trying to produce 10’s or 100’s of units in a 2-3 week time frame, essentially on-demand. The logistics are very complex, and Seeed does a fantastic job, but there are always things that take longer than expected. What’s the quality of the hardware? 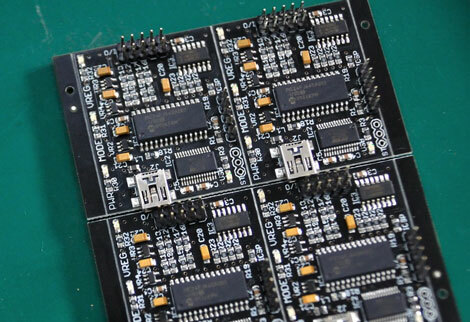 The quality of PCBs is excellent, and the assembly work is fair to good. There are sometimes problems specific to a manufacturing run. One batch of Bus Pirates shipped with a poorly soldered LED, another shipped with the bootloader only. These are minor problems that can be fixed quickly with a soldering iron or USB firmware upgrade, but problems happen. We’re open about the problems that crop up, and want you to be aware should something happen. Seeed will replace hardware with manufacturing defects if you can’t repair it yourself. Please consider our projects to be prototypes, not consumer products, Seeed is an alternative to building it yourself. Keep in mind that you may need to break out a soldering iron and fix something. If this turns you off, please don’t buy our stuff, it’s not for you. Edit: This section was harsh to manage expectations, gave it more concrete examples. Can I cancel my preorder? Absolutely, we don’t want to hold you hostage. It’s a bookkeeping nightmare for Seeed though, so please understand the preorder process before you order. Seeed accepts returns for manufacturing defects, but please ask for help solving your problem in the forum first. Pick and place image by Peripitus CC-BY-SA. Bus Pirate v2go manufacturing image courtesy Seeed Studio. This entry was posted on Wednesday, March 17th, 2010 at 8:22 am	and is filed under kit biz. You can follow any responses to this entry through the RSS 2.0 feed. You can skip to the end and leave a response. Pinging is currently not allowed. I never get this explained so throughout and clearly… Thanks Ian! We think you’re doing a fantastic job. Nobody else is offering a service like this, and innovation is never without growing pains. Keep up the great work! I can’t agree more, the Seeed process works fantastic, for the constraints this process places on you. Short runs are obviously hard! I think the great “commercial” product that comes out the other side reflects the attention you all pay to the process from design to dispatch to us customers. I couldn’t contemplate the headaches of soldering all that SMT stuff, nor trying to make a board anything close to as professional as this! It’s been videoed in a small NewZealand PCB assembly company.